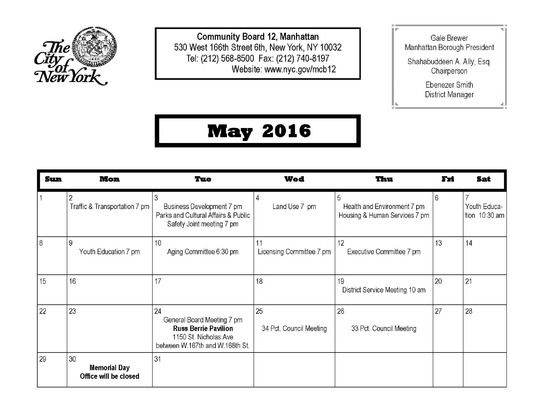 Please find below the CB #12, M May 2016 meetings calendar and May's committee agendas. Please take notice that on Tuesday, May 3rd Parks & Cultural Affairs Committee and Public Safety Committee will have a joint meeting to discuss enforcement and safety issues in our many parks and playgrounds. The Public Safety Committee will not meet on Wednesday, May 4th, 2016. 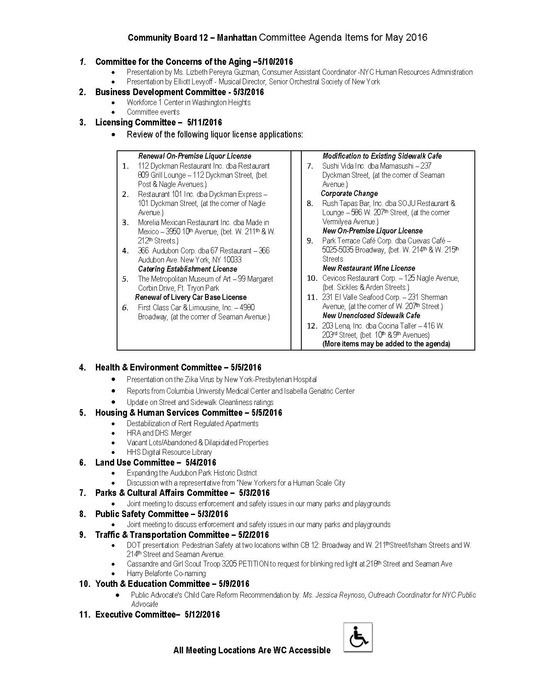 The Youth & Education Committee is meeting on Saturday, May 7 at 10:30 am at Isabella Geriatric Center located at 515 Audubon Ave. at the corner of West 190th Street and is having its regular meeting on Monday, May 9 at 7 pm at the Board Office, 530 West 166th Street, Room 6-B. As you may know, the Aging Committee has a new meeting day, the second Tuesday of the month at 6:30 pm at the Board office Room 6-B. If you would like to print a hard copy of the May calendar please click on the title above or on the calendar below. If you have any question regarding the CB #12, M May calendar please call us at 212-568-8500. You are receiving this email because you have signed up for our mailing list. If you wish to unsubscribe you may do so by clicking the link below.